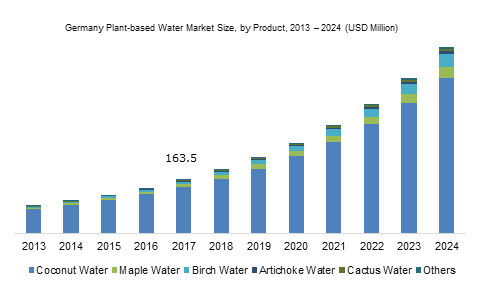 Rising health concerns and changing preferences of the consumer towards healthy beverages will drive the plant-based water market in next seven years down the line. Plant based water are non-alcoholic beverage with high concentration of vitamins and nutrients. The product is gaining momentous demand owing to popularity stems from performance and sports industry. These products combined to provide targeted package of taste, lifestyle and convenience along with wellbeing appeal. Budding awareness for healthy diet among European consumer, followed by social marketing involvements aimed at changing customer’s behavior will provide new avenues to the plant-based water market in next few years. Europe market has been fragmented based on product type, distribution channel, flavor variant and pack type. Various kind of plant-based water include cactus water, maple water, artichoke water and birch water. The other niche product segment includes aloe Vera, watermelon, olive water. Based on volume, coconut water will acquire lion’s share in the product market whereas maple and birch water will have growth rate of above 25% by the end of forecast timeframe. Germany, The Netherland, France and United Kingdom will increase the plant-based water market in next few years. Based on flavor variant, the plant-based water market is fragmented into flavored and unflavored. Owing to inclination towards authentic and natural food tastes, unflavored variant will dominate the product market share in next few years. Product channelizing play a vital role in increasing the market demand. Hectic lifestyle along with ease availability of plant-based water on online platform will propel the product market. Moreover, increasing transparency along with easy return and refund policy will drive the plant-based water market through online platform. Major players of the European market include BelSeva, PepsiCo Inc., Sibberi, The Coca-Cola Company, DRINKmaple, Nordic Koivu, happytree Maple Water, ARTY Artichoke Water, Vertical water and Oviva Maple Water Company.